Sony announces the new NEX-FS700 Full-HD Super Slow Motion camcorder, the latest in Sony's line-up of NXCAM interchangeable E-mount camcorders. 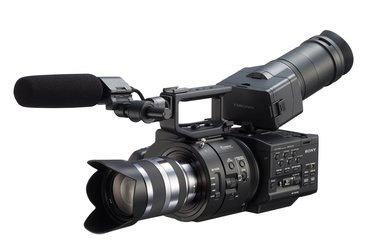 The FS700 is designed for high-speed shooting, capable of capturing footage at up to 960 frames per second and features a range of capabilities such as 3G HD-SDI output and built-in ND filters. The NEX-FS700 utilizes a new 4K "Exmor" Super 35 CMOS sensor and the E-Mount flexibility is designed to accept virtually all SLR and DSLR 35mm lenses with the use of simple, inexpensive adapters. Users can also capture high-quality still images with "face detection" and auto focus to help ensure that a subject is always in focus. The NEX-FS700 offers creative options, shooting styles and enhanced ergonomics to deliver a flexible production tool that can fit seamlessly into a variety of shooting applications.